Emmanuelle Riva (24 February 1927 - 27 January 2017) had a successful career on the stage before taking on the role of Elle in Alain Resnais’ critical and commercial hit Hiroshima mon amour (1959). Although never equalling the impact of that performance, she was also impressive in Jean-Pierre Melville's Léon Morin, prêtre (1961), Georges Franju's Thérèse Desqueyroux (1962) – for which she won the Best Actress Award at the Venice Film Festival, Thomas l’imposteur (1964, also directed by Franju) and Three Colors Blue (1993). Born Paulette Germaine Riva in 1927, in Cheniménil, northeastern France, Emmanuelle Riva was an only child born to Jeanne and Alfredo Riva, an Italian immigrant who worked as a sign painter. Her childhood dreams of becoming an actress were initially opposed by her father, however she pursued her ambitions regardless throughout her teenage years, appearing in various school plays and amateur dramatics groups. Eventually, after leaving school, she submitted to her parents’ wishes and learned to sew, becoming a seamstress. Emmanuelle however never abandoned her desire to become an actress and on discovering an advertisement for a contest held by the Dramatic Arts Centre in the Rue Blanche in Paris, set out for the city in the Spring of 1953. At the contest she auditioned in front of Jean Meyer, one of the leading actors and directors of the Comédie-Francaise. Her performance of a scene from play by Alfred de Musset mesmerised Meyer and the other members of the judging committee who awarded her a scholarship. Her professional stage debut came in a production of George Bernard Shaw’s Arms and the Man. This was followed by further classical roles in plays such Mrs Warren’s Profession (Shaw), L’Espoir (Henri Bernstein), Le Dialogue des Carmélites (Georges Bernanos), and Britannicus (Jean Racine). She made her screen debut on television playing the Queen of England in the historical anthology series Enigmas de L’Histoire (1956-57). The following year she appeared in her first feature film with an uncredited role in The Possessors (1958) opposite screen legend Jean Gabin. While appearing in L’Epouvantail on stage in Paris, Riva was visited in her dressing-room by a young documentary film director, Alain Resnais, who was seeking a lead actress for his first feature film, Hiroshima mon amour. He had been impressed by Riva’s performance, especially the quality of her voice, which he felt had the right timbre for the lengthy dialogue sequences in the film. He took photographs of the actress to the film’s screenwriter, Marguerite Duras, who was equally convinced that she was right for the role of the unnamed French actress caught up in a brief but intense love affair with a Japanese architect in post-war Hiroshima. Riva’s powerful, haunting performance fully justified the faith placed in her by the filmmakers, helping the film become a huge art-house success. 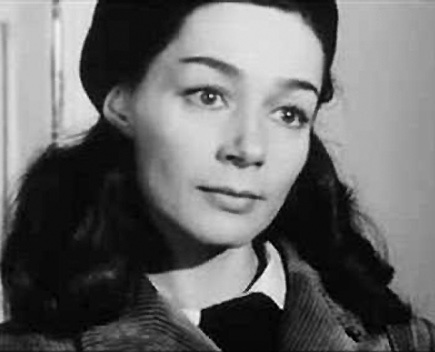 Riva’s performance in Hiroshima mon amour brought her to the attention of other directors leading to critically acclaimed roles as a lonely young woman in Marcel Hanoun’s Le Huitème jour (The Eighth Day, 1960), as a concentration camp victim in Gillo Pontecorvo’s Kapò (1960), and as an atheist widow in a sexually charged friendship with a priest played by Jean-Paul Belmondo in German-occupied France. In 1962, she won the Volpi Cup for Best Actress at the Cannes Film Festival for her performance as an unhappily married provincial wife who poisons her husband in the title role of Georges Franju’s Thérèse Desqueyroux (1962). She continued working steadily through the 1960s on such films as The Hours of Love (1963) opposite Jean Servais, again with Franju on Thomas the Imposter (1965), a first collaboration with Jean-Louis Trintignant in I Kill, You Kill (1965), and Risky Business (1965) co-starring singer Jacques Brel. She also worked on television, reprising her role of Thérèse Desqueyroux in La Fin de la nuit (1966) and La Forêt noire inspired by the life of composer Robert Schumann. In the 1970s, Riva worked largely on smaller French films, most of them for television. She also began publishing collections of poetry beginning in 1975 with Le Feu des miroirs. In the early 1980s she worked with two European auteurs, firstly with Marco Bellocchio on Gliocchi, la bocca (The Eyes, the Mouth, 1982) as a deeply religious mother whose son attempts to shield her from the truth about the death of his twin brother, and the following year with Philippe Garrel on Liberté, la nuit (1983) as the estranged wife of a revolutionary played by Maurice Garrel. Riva continued working in film and television, mainly in supporting parts, through the 1980s, 90s and 2000s. Notable roles included the mother of Juliette Binoche in Krzysztof Kieslowski’s Three Colors: Blue (1992), in Tonie Marshall’s Venus Beauty Institute (1999) and A Man and His Dog (2008), which reunited her with Jean-Paul Belmondo. In 2008, a book of photographs the actress took of Hiroshima while making Hiroshima mon amour was published in both Tokyo and France. In 2012 Emmanuelle Riva enjoyed an extraordinary career renaissance when she was cast in Michael Heneke’s Amour as an elderly woman’s whose relationship with her husband played by Jean-Louis Trintignant is permanently altered after she suffers a debilitating stroke. The Austrian director had always greatly admired Emmanuelle’s performance in Hiroshima mon amour, although he was less familiar with her subsequent work. However after auditioning her he realised she was, not only believable as Trintignant’s wife, but also uniquely capable of convincingly playing such a part. The film has captivated audiences around the world. It won the Palme d’Or at the Cannes Film Festival. Riva herself has won numerous awards for her performance including the BAFTA and César Best Actress awards.